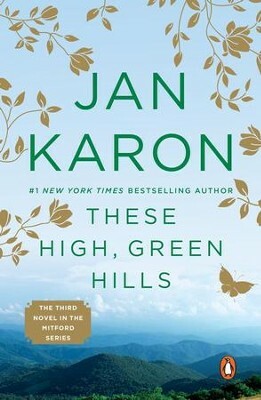 Jan Karon has created a town where we feel wonderfully at home. In Mitford, a village nestled in the hills of North Carolina, she shows us small-town life for what it really is: completely engrossing. And absolutely hilarious. In this irresistible third book of The Mitford Years series, Father Timothy Kavanagh is married to more than his lovable and eccentric Episcopal parishioners. He's also married to Cynthia, his vivacious and talented neighbor. Suddenly, the routine existence of a sixtysomething bachelor is out the window. How will they keep his sofa-sized dog at a safe distance from her arrogant, albeit famous, cat? Can he learn to love the old-Italian-villa look his wife is bent on giving the rectory? These concerns pale, however, beside the growing pains of Dooley Barlowe, the thrown-away boy whom the rector loves as his own son. Then, the poverty and violence of an area known as the Creek comes knocking at the rectory door. Clearly, being at home in Mitford has its challenges. And, when the rector goes on a camping trip with the church youth group, he's forced to confront the toughest challenge of all - his own fears. My thoughts? I love these books! When I finish this series, I will be missing these sweet friends from Mitford that I have grown to love! Cynthia's adventurous spirit brings so many surprises, especially during the camping trip! Miss Sadie's touching stories were my favorite part of this book. What is your favorite series of books? My favorite series of books are the Mitford books! I have read all of them and am looking forward to the new one coming out in September. I also like the Nancy Atherton Aunt Dimity series.